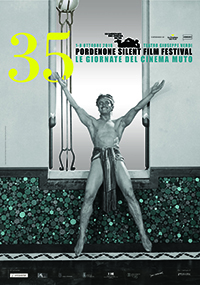 The 35th edition of the Giornate del Cinema Muto is happening this week, Oct. 1-8, 2016, with many Domitor members and leaders in attendance. Highlights include another look at the origins of early Westerns; more city symphonies; tributes to William Cameron Menzies, Al Christie, John H. Collins, Luca Comerio, and the Danish Film Institute; Polish silents; a focus on US presidential elections (of the past, we hope); restorations, rediscoveries, the canon revisted, and special events, including a special presentation 0f The Thief of Bagdad (1924). Of special interest to Domitor members is the early cinema program: R. W. Paul, Emile Cohl, German Chromolithographic films, Film d’Arte Italiana, and Shakespeare. Don’t miss the Domitor General Assembly on October 5 at 12pm in the Saletta Incontri of the Convento di San Francesco (the same location as last year), where this site will be unveiled!